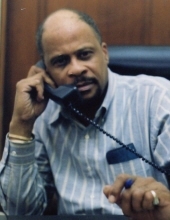 Celebrating the life of Matthew Moore Jr.
Obituary for Matthew Moore Jr.
Age 67 of the Hill District passed away on November 11, 2018. Son of the late Mary Louise and Matthew Moore Sr. Brother of Gregory Moore and Debra Baugh (Bruce). Visitation on Friday, Nov. 23, 2018 from 4-8pm in the Samuel J. Jones Funeral Home 2644 Wylie Ave. Funeral Service on Saturday, Nov. 24, 2018 at 11am in the Central Baptist Church 2200 Wylie Ave. Pgh. PA 15219. In lieu of flowers family requests donations of food to the church for the day of the service. To send flowers or a remembrance gift to the family of Matthew Moore Jr., please visit our Tribute Store. "Email Address" would like to share the life celebration of Matthew Moore Jr.. Click on the "link" to go to share a favorite memory or leave a condolence message for the family.